My two pet lovebirds have mated. What will their chick's color? 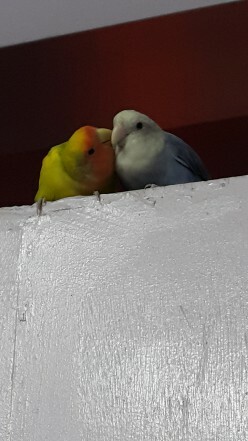 I have two pet lovebirds who have begun mating since yesterday. The male named Mumu is a pied peachfaced. The female named Lulu is a white-faced violet roseicollis. Is it possible that the chicks born will be mutations? If yes, what will the possible color mutations? If not, what color will they inherit? I am so curious and excited to know. I feel your excitement and now I am excited too. Are you going to write a hub about the whole lovebird experience? Correction: The title's second line is "What will their chick's color be?" Hi theraggededge ☺ How do you do? Yes, infact I am planning to write a hub about them since a long time. I have already written a hub about Mumu. I have hand-raised him. They began courtship several days before. I have been observing their behavior since so long...I am witnessing all this for the first time. I am so curious now!